The underwhelming performance of long/short hedge funds in recent years has led some to question their value as a strategy. While it's true that performance has been disappointing, it's important to understand the role that long/short strategies are meant to play in a portfolio and how they can be used most effectively to achieve investment success. We feel strongly that long/short equity is poised to prove its value given the potential changes in the market, and encourage investors to not prematurely abandon the strategy without first looking ahead at what's coming. What Are the Benefits of Long/Short Equity? Given its ability to provide strong, risk-adjusted returns in periods of higher volatility, long/short equity can be useful as a diversifier. Hedge fund managers have the flexibility to limit their overall market exposure by reducing their long positions, or by shorting individual stocks that they expect to underperform. 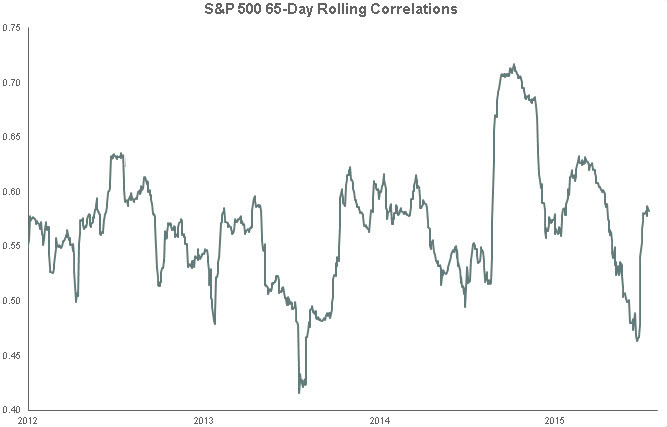 Historically, long/short equity has been only moderately correlated to U.S. stock and bond markets. This would be a desirable characteristic in a portfolio were interest rates to rise, or were equity markets to fall. While diversification is perhaps the primary function of long/short equity, it's important to not overlook the potential they have for generating additional returns. Hedge fund managers can capitalize on opportunities by shorting stock, timing the market through changes in their net exposure, and taking advantage of corporate actions that traditional long-only investors may overlook. Why Has Long/Short Equity Underperformed in Recent Years? Since 2009, U.S. stock and bond markets have experienced unusually high returns. Market conditions have rewarded risk-taking, while risk-mitigating strategies like long/short equity have suffered. It's important to recognize how unusual these conditions have been. The recent positive performance in U.S. equities, and in particular large cap stocks, has largely been propelled by monetary policy. Stimulus policies like quantitative easing, coupled with declining interest rates, have pushed return-seeking investors into riskier assets. Furthermore, volatility has fallen to near-record lows. These factors have contributed to an optimistic market environment in which lower correlated, risk-mitigating strategies have lagged. Hedge fund managers have faced significant challenges due to the high correlations in equities since 2009. With everything moving in the same direction, it became difficult to identify opportunities that would generate additional returns. Furthermore, the increased frequency with which investors buy into and sell out of index and ETF products has led to a distortion in the relationship between a company's fundamentals and its stock price. However, we caution investors not to give up on long/short equity prematurely. Just as you wouldn't rely on yesterday's weather forecast to decide whether or not you need an umbrella tomorrow, we advise focusing on what lies ahead in the markets rather than dwelling on the recent past. Investors who rely too heavily on asset classes that have been strong performers in recent years risk missing their exit when a new market phase begins. What is the Current Outlook for Long/Short Equity? We expect this optimism in the market to dissipate somewhat as changing conditions lead to more moderate returns and higher volatility. Simply put, the markets likely cannot continue at their current pace, and with an interest rate hike on the horizon, investors should be looking toward asset classes that can weather the transition. Furthermore, while equity correlations are still historically high, we've recently seen more of a downward trend, which should provide hedge fund managers with more opportunity to add value in their portfolios through stock selection. We strongly encourage that investors consider long/short equity when seeking better risk- or volatility-adjusted returns in the coming market environment. In particular, we believe that long/short equity can fill this role better than diversification across traditional asset classes, due to its more moderate correlation to traditional stocks. While there will be periods where this return relationship breaks down, we feel it's important to focus on the long-term benefit of long/short equity. We're continuing to have a slight overweight to long/short equity in our model portfolios, both to complement our long equity position and to offset our underweight fixed income position. We're confident that this is a sound strategy in spite of the recent underperformance in long/short equity for two important reasons. First, when the disappointing returns of the last three years are viewed into a wider context, the picture changes dramatically. Historically, long/short strategies have offered attractive returns with lower risk. 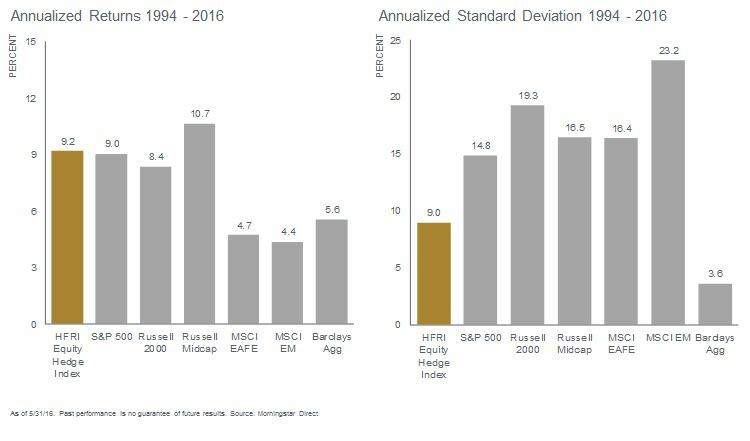 Over the last 20 years, the HFRI Equity Hedge Index has outperformed the S&P 500 — and done so with 40% less volatility. Second, long/short equity's resilience in periods of higher volatility seems tailor made for what we expect for the markets going forward. The risk-mitigating characteristics offer the potential for achieving higher returns in what could be an increasingly volatile market, especially considering the various uncertainties that still loom on the horizon. Many indicators seem to point toward a new market phase in which long/short strategies would be poised to deliver value in a portfolio. While other considerations, such as investment goals, risk tolerance, the need for liquidity and taxes must always factor into any decisions about how assets are allocated, investors who have found success with traditional asset classes since 2009 would be wise to consider how long/short equity could fit into their portfolio, and those who are considering selling the long/short positions they currently hold may want to reconsider in light of the expected shift in the market environment.